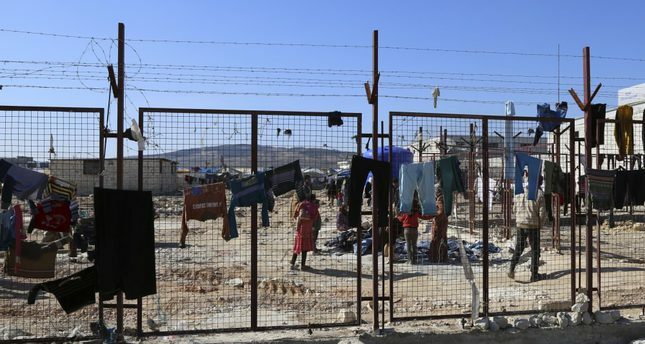 People walking around a temporary refugee camp built by the Turkish aid group IHH for displaced Syrians in northern Syria. COLUMNS What is happening in the basement of that building in Cizre? The current picture in Syria is simply horrendous. Iran, Russia and Lebanon's Hezbollah are in the field, the anti-DAESH coalition is trying to repel DAESH militants with airstrikes, Russia backs up Syrian leader Bashar Assad's regime against the moderate opposition under the guise of fighting against DAESH and Russian businessmen are selling DAESH oil to Damascus and making profits. The now five-year war has turned into an international conflict, caused about 400,000 casualties and millions of people have had to leave their homes, jobs and country. Turkey is one of the leading countries damaged by the results of the war. The country is confronted with an enormous amount of refugees and the problems in Syria are reflected in Turkey's domestic affairs, in a way. There are also some other problems that bring heavy costs. The only thing Europe does is use Turkey as a field to limit refugees heading to the West. In a nutshell, the Middle East is once again highly aggrieved. To employ a Turkish saying, the West is searching for the people's lost donkey by whistling. On top of it all, Turkey is currently tackling a different problem coming from Syria. The outlawed PKK, which has caused 50,000 casualties in Turkey with its terror attacks which began in the early 1980s, aims to found a state in Syria. The PKK's Syrian affiliate Democratic Union Party's (PYD) armed People's Protection Units (YPG) seized several regions in northern Syria, including Kobani and Afrin. However, the PYD has to seize regions controlled by the opposition, especially Azaz, to physically unite its regions and build a united Rojava. Of course, Turkey does not want to allow the rise of the PYD across the border, which provides human resources and weapons to the outlawed PKK. What kind of a legal state in the world can remain indifferent to such a condition? The PYD has already started to harass its de facto neighbor Turkey before completing its unification process. The YPG launched an attack on Turkey recently. Upon the harassment, Turkey has, since last weekend, resorted to some military actions within the rules of engagement recognized by international law. The Turkish Armed Forces (TSK) has been shelling the YPG, which have been attacking the moderate opposition fighting DAESH west of the Euphrates. The reason for Turkey's intervention is not the YPG's attack on moderate opposition forces who are also recognized by the U.S., but indirect solidification of DAESH. The PYD also kills Turkmen civilians and forces them to migrate in order to have the ethnic majority in the region it hopes to seize. So how can this crisis, which will deeply influence the entirety of Europe and the balances of superpowers in the region, be dealt with? The answer to this question undoubtedly includes some long-term plans. But civilians are still being killed. Only two days ago, Russia struck hospitals and schools supported by Doctors Without Borders. According to U.N. figures, some 50 civilians, including children, were killed in this latest Russian attack. We must first of all consider possible immediate solutions. The only thing that currently comes to mind is implementing Ankara's plan to establish a no-fly zone for Turkey in northern Syria. German Chancellor Angela Merkel recently announced that she favors the idea, which raises hope. Now, eyes are on the U.N., which has become more passive due to the political ambitions of term presidents.The situation is getting even graver as the international community postpones issuing a decision on a no-fly zone, which was implemented during the Gulf war and prevented the deaths of hundreds of thousands of Kurdish civilians.